Reflections on the wonders of our Scottish geoheritage, inspired by our landscapes and fossils and other natural phenomena through the aeons of deep time. Our first entry arises directly from the writing competitions. 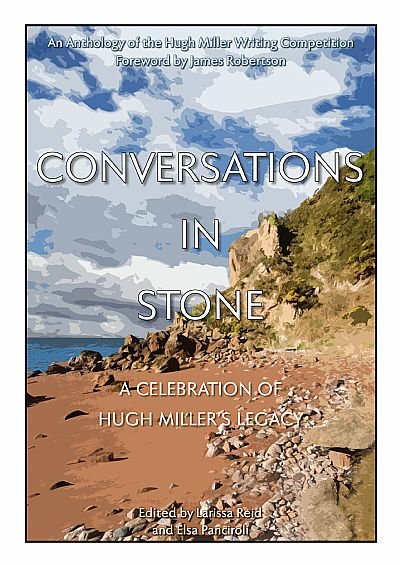 "Like wandering in a vast museum of everything"
This is how the Scottish writer James Robertson characterises the works of Hugh Miller in his foreword, and it could well describe the Miller-inspired writings which follow in this treasure chest of a book. One of the book's editors, Larissa Reid, joins the renowned nature-writer Robert Macfarlane in Archipelagos of Thought; she begins : "In my hand, I'm holding a piece of bloodstone." The name comes from its flecks of red iron, amidst its "hazy green blue, beautifully smooth rock" from the Isle of Rum. She has since childhood questioned how landforms have taken shape. She first read Hugh Miller's My Schools and Schoolmasters in 2015 and was "at once transported" back to her childhood and duly set up the first Hugh Miller Writing Competition. About the same time she discovers Macfarlane's book Landmarks. He gives her his thoughts on landscape writing by an Oriental plane tree in the garden of his Cambridge college. Cromarty's own first prize-winning star Janie Verburg has Miller so close to her in Learn to Make a Right Use of Your Eyes, that she has "felt the fringes of your shepherd's plaid brush my arm." Perth poet Jim Mackintosh in Old is Tomorrow, narrates how Hugh's footprints are "apparent today in the unravelling of our tomorrows." You can sail with Joyce Gilbert and Simon Cuthbert as they go Voyaging with Hugh Miller, reliving their discoveries aboard the old converted trawler Leader tacking around the Small Isles and the islands off Argyll, as reflected in his books Cruise of the Betsey and Testimony of the Rocks. Michael Davenport whispers the name of one of the man's most famous fossils, Pterichthyodes milleri in his epoynymous poem, as it "swims in warm seas" and Miller "moves clear of tragedies and struggles." Shelter with Miller from a storm as he carves his name beside others in a man-made cave on Orkney, as told by Antonia Thomas in Written in Stone: Geology and Graffiti in Orkney. Mike Taylor locates Hugh Miller's Palace of Printing, namely The Witness printing office in the capital, and relishes the Editor and his colleagues competing at shot putting in the backyard, and him winning a contest to make a standing jump from the floor on to his desk, thereby splitting it in two. Jim Gilchrist emulates Miller's "pre-cinematic, diorama-like sweep of prose" in writing of the club moss stumps off Crail harbour in Fife before heading off to the abundant sites of fossiliferous Wyoming, USA., in his essay Crawling Cards from Time out of Mind. That crucial unrecorded space in the fossil record, known as Romer's Gap, is explored by Justin Sales, including a diverting passage on the fossil hunters with their "backpacks and bubble-wrap,"..."swept back at nightfall to warm pubs and cold tents." Larissa's co-editor Elsa Panciroli intriguingly interweaves in Fossils of the Mind, her own journey back by van from fossil-hunting on Skye with Hugh's travel by carriage from Loch Carron to Dingwall after his exploits on the Betsey. Poet Alex Woodcock's extraordinary paean to a millipede, Peneumodesmus newmani, is accompanied by the book's moving tailpiece, his eloquent appreciation of his prize of a weekend in Cromarty. Landward by Thomas Halliday, also has a tribute to make. His is to our ancestor, the four-legged amphibian Casineria found on a Lothian shore, Yellowcraig, opposite the Bass Rock. Gillian Dawson is similarly awed by The First King of Scotland, a "rearing centipede," Wareolestes Rex, as he feasts among the horsetails and tree ferns. A third homage of a sort comes in After Life: Finding Tiny from Fiona Ritchie Walker. who after finding Tiny, a sharp-toothed Devonian fish, and Miller in her local library, records a "life change" which has sent her to "rocks and beaches/museums and scree slopes." Kenny Taylor, in Echoes from Orcadie wanders the coastlands of that vast Devonian-era lake. Ross Barnett, in Impressions, curates his own past while relating to his career learning about fossils. It is an intimate, witty, but also sad history from first childhood explorings of shells on Raasay to the present. The transience of life as marked from the footprint outlines in Skye sand of a "Jurassic mother" to the headstone lettering by Hugh on the grave of his first child Eliza is recalled in Deep Absence by Cromarty's own Alison Seller. Here are also contributions from a young climber, Paula Hunter, on an ascent of self-discovery, notable poet Kenneth Steven, and in Gaelic and English by broadcaster and singer Mary Ann Kennedy. But it would be impossible to summarise every piece of this tapestry-like collection. Each one deserves its own attention, which is why I commend this book so wholeheartedly to every one of our members. Purchasing one will help fund the next, third writing competition, and in that way, further sustain Miller's legacy. The Friends are among principal sponsors for the publisher, the Scottish Geodiversity Forum, along with Scottish National Heritage, National Trust for Scotland, University of Glasgow (The Hunterian), Royal Scottish Geographical Society, Dynamic Earth, the Scottish Centre for Geopoetics, Geobus, Cromarty Arts Trust, Lochaber Geopark, and Mr Wood's Fossils. We continue this section with links to an introduction by geopoet Norrie Bissell, Haiku Walking, and an article by Elsa Panciroli on current breakthrough discoveries in Scottish palaeontology. A very broad area, embracing all Miller's other interests, and how they are interpreted and carried forward in the 21st Century.. Folklore, History including church, social, literary and political, Journalism, Stonemasonry and related crafts.We start Section Two with the first poem we have read on the Disruption of 1843 in the Church of Scotland, entitled Hugh Miller's Lament, submitted by Glasgow poet Jen Gray. 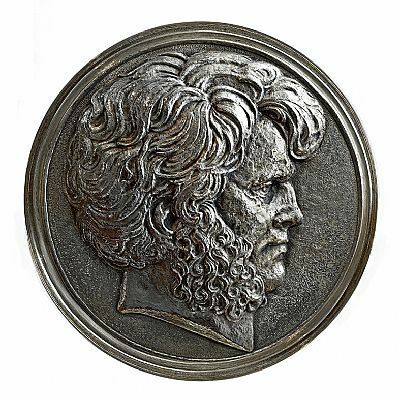 Both sections will feature links to a regularly changing series of articles, essays and poems, some of them entries to the Miller writing competitions, some volunteered by Friends members and visitors to this website. Please do submit a piece of your own for publication whenever you like!